Ginger - download in one click. Virus free. Download the latest version of Ginger with just one click, without registration. It comes with a safe official web installer for Windows. Ginger is an English grammar and spelling checker with a lot of additional features that can be useful for anyone who writes in English any official letters, personal posts in social networks, or articles for online journals. 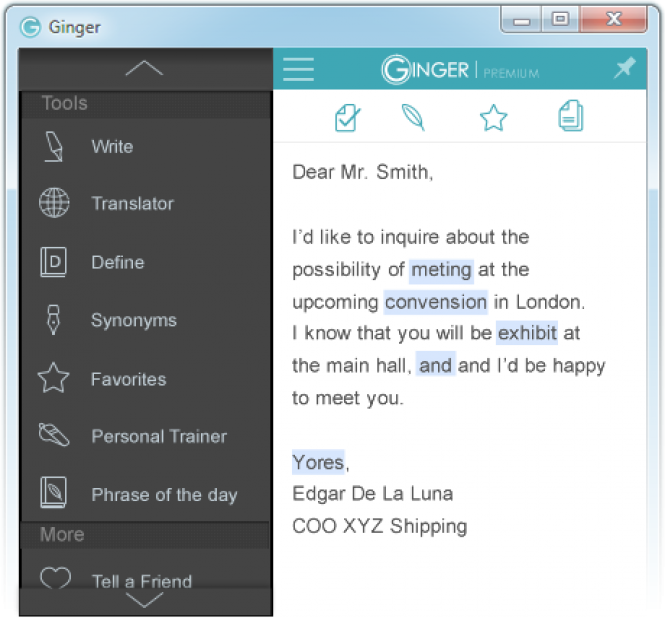 The main feature of Ginger is checking grammar and spelling of English text. It will automatically review your text for any misspelling, punctuation issues, and grammar mistakes. In addition to that, Ginger will suggest rephrasing for any chose sentences to add more clarity and style to your writing. Then, Ginger works for your productivity, saving time with word prediction that suggests the next word when you're starting to type it. And if you need to find a contextual synonym or see the word definition, Ginger has a built-in dictionary for those, so you don't have to check your words elsewhere. Finally, Ginger has a built-in translator that supports over forty languages. The list includes Spanish, German, Japanese, and French, and the translation interface is as simple as it gets: choose a language and input the English text, the rest will be done automatically. All in all, Ginger is a useful program with a vast set of functions. It provides personalized experience based on the most frequent mistakes and allows practicing English, too. 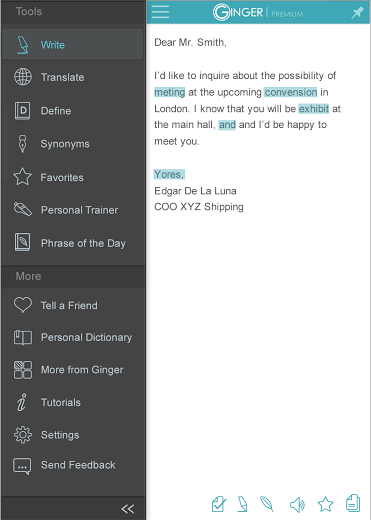 It uses your own writing with the most common mistakes to organize grammar lessons and practice sessions for you. Check out this free download to see what experience it can provide - and how much better your English skills can get.